Lucas, Zoe. 1981. Wild Horses of Sable Island. Greey de Pencier Books, Toronto (An OWL Book), 34 pages. Note (ZL): This is one of the series of OWL True Adventure Books for young readers published by Greey de Pencier in the 1980s. Others in the series included Janet Foster’s “A Cabin Full of Field Mice” and Katherine McKeever’s “A Family for Minerva”. These small books (18 x 14.5 cm) were produced using the same format and design, and the first editions were hardcover. 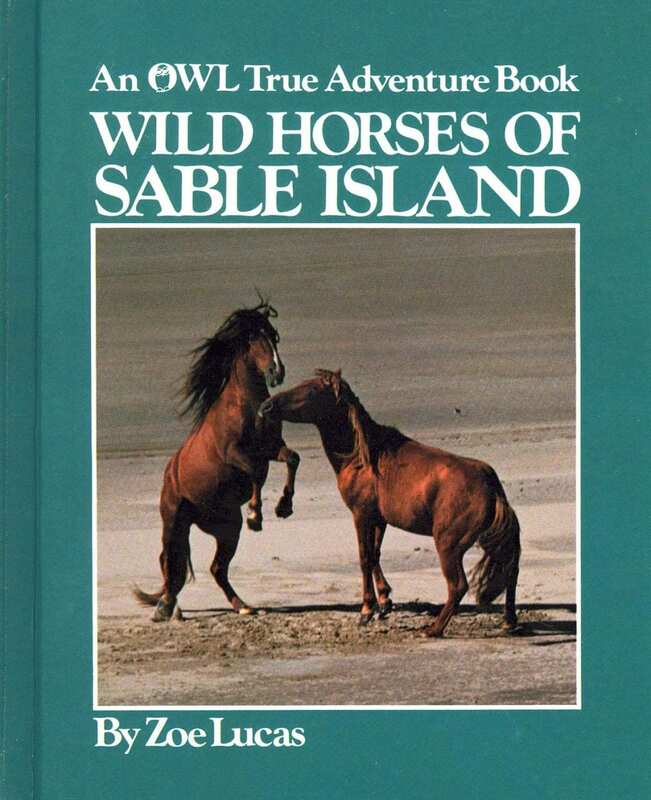 Wild horses of Sable Island highlights events in the life of a young stallion, Seafire. During long summer days he and his band have abundant grass and pea to eat and time to rest in the sunshine and mild sea breezes. Then in winter the horses spend more time seeking shelter from wind and snow, sometimes finding themselves in the company of grey seals. Meanwhile, Seafire must fend off challenges from another stallion, Northwind. The 1200-word text is illustrated with 16 colour photos (12 of which are double-page spreads). This book is almost 40 years old (and by today’s standards, some of the photos seem a little murky), but copies of a paperback edition are occasionally available online. However, it’s unclear if these are leftovers of old stock or the book is still being printed. The Sable Island horse character Northwind was originally called Brownie. However, the publisher felt that the name was too “wimpy” for an aggressive and persistent stallion. So, after some discussion one evening in the Sable Island weather office (in the operations building of the Meteorological Service of Canada), the technician on duty and the author came up with the name Northwind. Long after this small book was published, when the two horses who had inspired the characters of Seafire and Northwind were retired from their careers as band stallions, they ended up becoming companions, and were often seen grazing side-by-side or snoozing together in the evening sunshine.